The aim of the research project within the Law and Anthropology Department is to investigate socio-legal processes within Germany’s complex and plural society from a legal as well as an anthropological perspective. The main goal of the research is the analysis of extrajudicial dispute resolution mechanisms among a number of minority groups (defined ethnically, culturally, and religiously) living in Germany. The project is primarily rooted in the theories and methods of normative plurality, with specific interest in the coexistence of competing and conflicting normative orders and the associated multiplicity of legal systems and sources of law. Thus, the team’s research agenda is committed to a broad, all-encompassing concept of law in society that takes into consideration both the social anthropological approach to normativity, broadly defined, and the rule- and precedent-based approach commonly adopted in jurisprudence and legal studies. Drawing on this analytical approach, the research team adopts the concept of semi-autonomous social fields as defined by Sally Falk Moore. The complex operation of the social field is to a significant extent self-regulating, self-enforcing, and self-propelling within a certain legal, political, economic, and social environment. The concept will enable the team members to understand actions, processes, and rules generated internally and adopted from the wider world, as well as to examine how social fields articulate with one another. The empirically grounded, upcoming qualitative surveys will be evaluated in the context of the current legal framework of the Federal Republic of Germany. The elaboration of differences and similarities of several normative spheres will allow the researchers to develop new comparative perspectives in the debate on Paralleljustiz (‘parallel justice’) and contribute to a more nuanced understanding of the polymorphism of law. Mahabat Sadyrbek&apos;s postdoctoral research project aims at a comprehensive empirical study on the legal structures and conflict regulation mechanisms within the Russian-speaking communities in Germany. She is particularly interested in the legal life of minority groups from the Caucasus region. The guiding research questions include: What constellation of legal relationships have the people from the countries of origin brought with them? What sources have shaped these legal structures? How do they position themselves in the German or European legal context? Cengiz Barskanmaz’s postdoctoral project will focus on conflict regulation practices in the numerous fragmented Yazidi communities in Germany. He is interested in understanding interplay of modalities of conflict settlement in community practices through the lens of legal consciousness. Legal consciousness mainly refers to the sense of justice, legal and normative values, ethical principles, and models of interpreting the law. 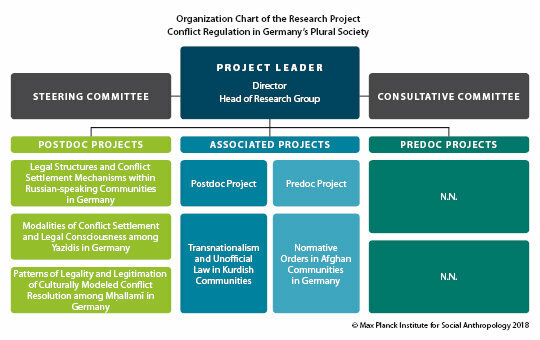 Mahmoud Jaraba’s project explores the kind(s) of alternative dispute resolution mechanisms that exist among Mḥallamī in Germany. He aims to identify the major actors and the mechanisms that the focus groups use in order to reach extrajudicial settlements. He analyses the socio-economic and anthropological layers entangled in the history, clusters of values, guiding principles, symbols, rites, traditional folk wisdom, legends, and mentalities of Muḥallamī. Knowledge of these diverse patterns of legitimation will enable Jaraba to draw conclusions regarding the potential of the various conflict regulation mechanisms and the line of demarcation between official state law and unofficial normative orders, where the concept of legality gains relevance. Kutaiba Kaidouha&apos;s research is a PhD project within the broader project of "Conflict Regulation in Germany&apos;s Plural Society". Since Syrians came to Germany in large numbers following the civil war, the German state has been forced to deal with the various dilemma within Syrian society. This is particularly with respect to family disputes, spousal relationships and divorce. The questions addressed in his research include why these issues arise, what are the reasons which push Syrian families to act as they do and what are the changes that are undergoing Syrian families, especially with respect to women? The research will try to understand the structure of the Syrian family from the inside as well as the legal factors related to divorce in the German and Syrian communities, and conduct a field study to find out the reasons for the change in Syrian character in this new society. Latif Tas focuses on the diverse legal practices that are based on different normative perceptions in the Kurdish communities in Berlin (Germany) and Diyarbakir (Turkey). By focusing on inter-family and transnational cases, he examines how gender-specific norms and relationships are affected by the application of non-state judicial processes. This leads into an analysis and discussion of the practical consequences of non-state legal systems for women&apos;s rights and gender relations. Afrooz Maghzi&apos;s research project focuses on the diverging normative orders within communities of Afghan origin in Germany. The project addresses the question of how the German state can adequately respond to the clash of normative practices of Afghan communities and state law. A comparative study will show how differently the specific needs of minorities in Canada and the United Kingdom can be addressed, and how they can help build a constructive relationship between Afghan communities and German state institutions.